Passengers are welcome to board our ship at 6:00 p.m. After comfortably settling into your cabin, we'll introduce our crew at a welcome cocktail. Tonight, join us on an excursion for both packages: Guided tour of Bordeaux "by night". We will cruise down towards Pauillac. This morning, join us on an excursion for both packages: Helicopter ride(2) - fly over the gorgeous Médoc! Experience a bird's eye view of the numerous châteaux and famous vineyards that give the region its reputation. It's a once in a lifetime experience! **Unavailble from April to the end of June. Historical and oenology ethusiasts, embark on a cruise along the Gironde. You will discover the precious wines from along the Garonne and the Dordogne estuaries. Explore the Medoc by bike following a trail where you will discover a diversity in architecture unique in the world, from large mansions to sumptuous buildings such as the Citadelle Vauban. Enjoy the sublime aerial panorama offered by the Medoc during a helicopter flight, an exclusive to CroisiEurope that promises to dazzle you. 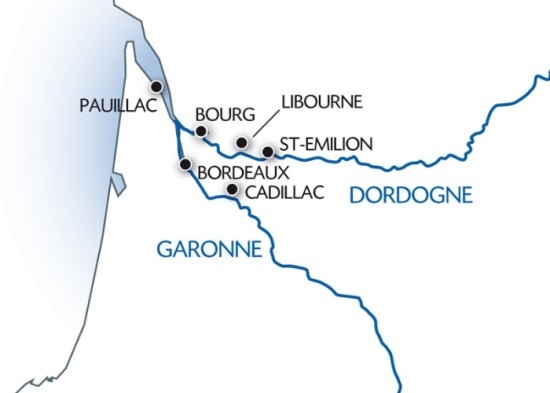 Depending on the tide, the stopover in Pauillac may be replaced by Cussac-Fort-Médoc and Blaye and Libourne by Bourg. The Bordeaux "by night" excursion must be booked in advance. Subject to availability and favorable weather conditions.